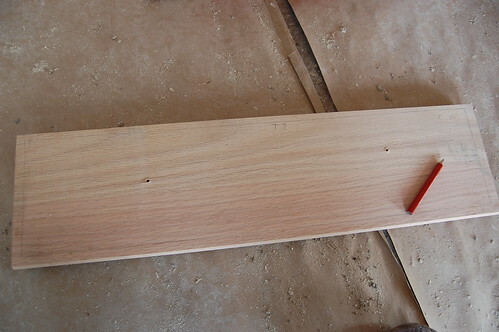 How To: Make a sink base out of a regular cabinet. I admit to being slightly stumped in the “unfinished cabinet aisle” at Lowe’s as I started counting out the sizes for sink bases. Thirty-six inch, thirty inch… um… twenty-four? Anyone? Anyone? Bueller? Because we have exactly room for seventy-three linear inches of cabinetry in the station, and nary an inch to spare. That gives us room for two twenty-four inch cabinets and space for a mini-fridge, and no amount of creative measuring was going to make a thirty inch cabinet work. 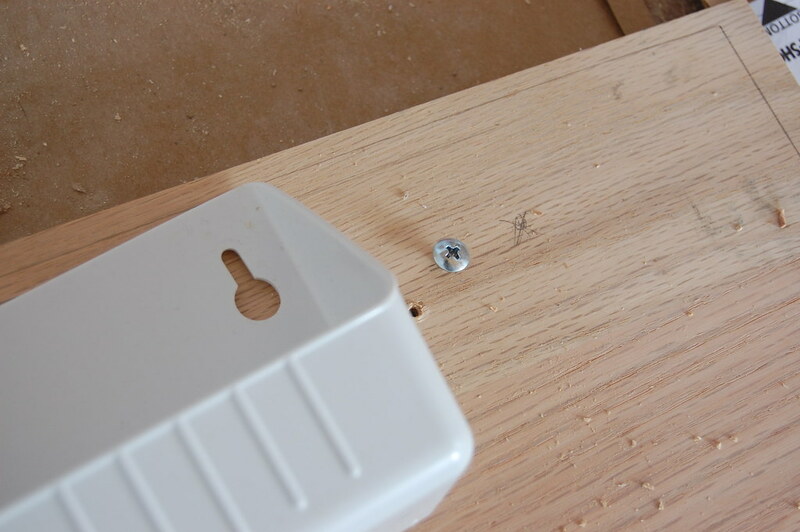 Then, after a moment pondering the mysteries of the universe and cabinet measurements, I remembered I own a drill. 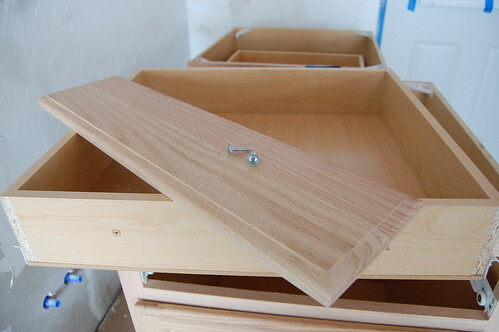 Therefore, the universe (and wonderful world of cabinetry) is my oyster. This one was so easy, I’m not sure it even merits a post and yet, it almost didn’t occur to me that I could do this and I wouldn’t want anyone else to fall into that trap. 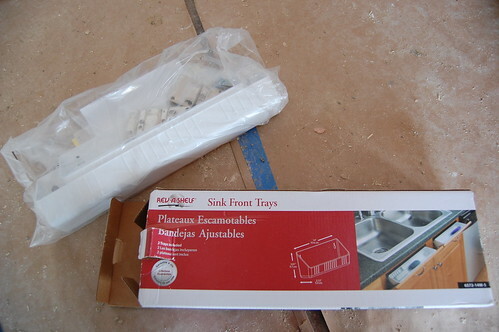 Also, these trays can be installed on a regular sink base and are ultra-handy. 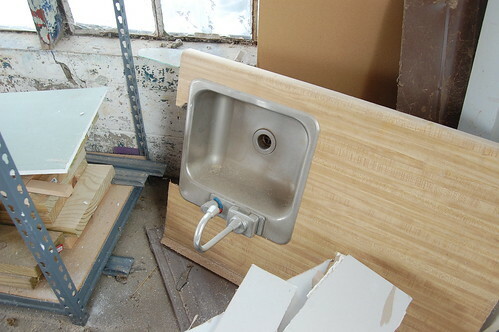 The reason a 24″ base will work for us, is because we’re using a small “bar” sink we salvaged from a demo-job in the Station kitchenette. Yeah, it came with the counter top. Easy enough to pinch and remove them. 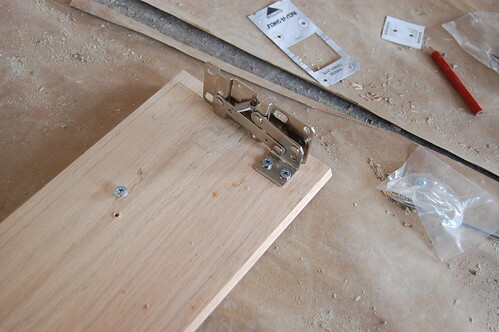 And at this point you could simply screw (or glue) the drawer face back on to the cabinet and be done with it. But having handy little sink-front trays is more exciting. I bought this kit at Lowes for something like $15. 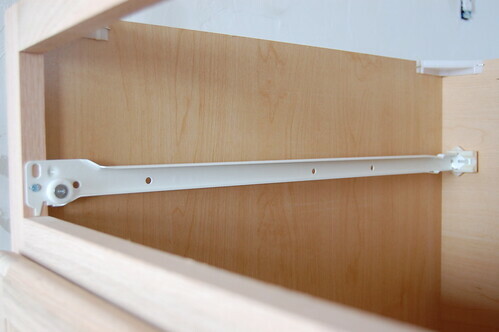 When you will only have 72″ of cabinet space for a year, every little bit of storage counts. It came with a handy little template for marking everything out. 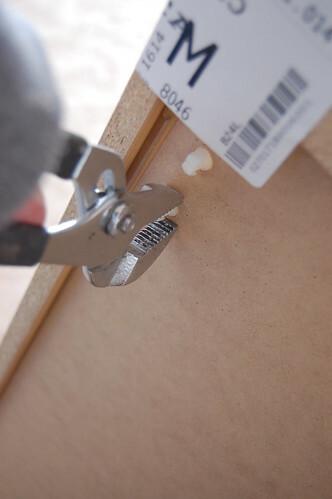 Which results in perfectly pre-drilled holes. 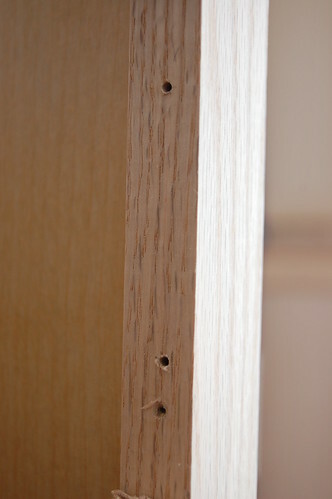 For hinge placement, I marked the opening of the cabinet frame on the back of the drawer face. 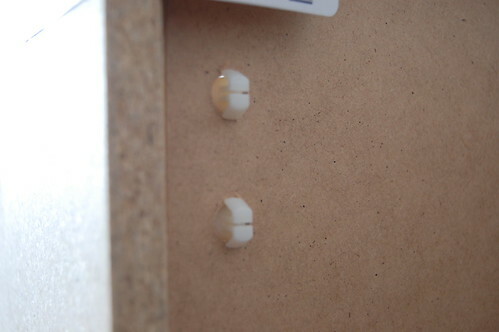 And while laying everything out, I also inserted the screws that would hold the sink-front tray. 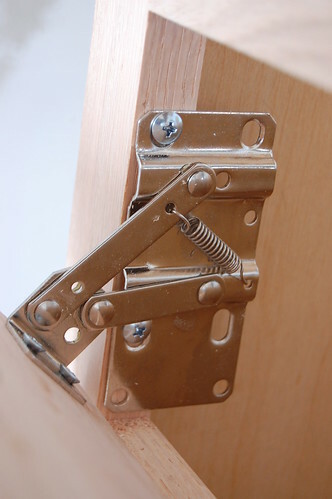 And when both hinges were attached to the drawer-front, to fasten them to the cabinet frame. Here’s to not letting ourselves be limited by standard cabinetry sizes! Did you have any problems installing the sink? The sink in your pix looks like an over counter. 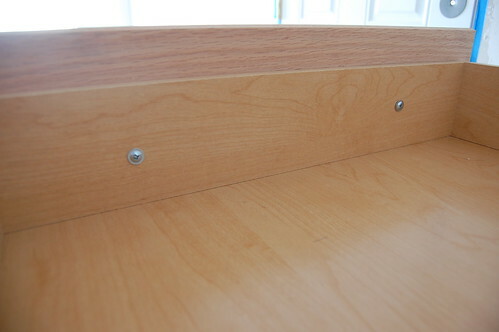 Did you use any of the counter top? What did you do? LOVE IT!!! 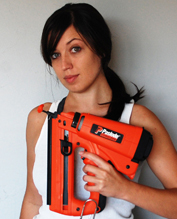 I am remodeling on a budget OF COURSE! 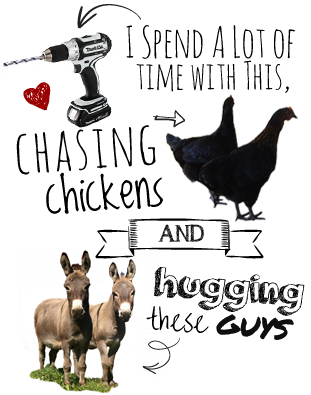 is there any other way! SOOOO this is so helpful because I insist on doing this ALL ON MY OWN!! It’s a great sense of acomplishment & I LOVE the look on hubby’s face when it’s done! WOW! I was so excited that I found a video that would help me build a simple sink cabinet. Once I got the end I was, Um huh? what? where’s the sink? where is the counter top? I was disappointed that I still don’t how to build one. Thanks, I guess? Thanks for clearing that up, Kit!! LOL I was wondering where the video was!!! Don’t let em get on your nerves sugar, I loved this post!! told me exactly what I needed to know. Thank you. 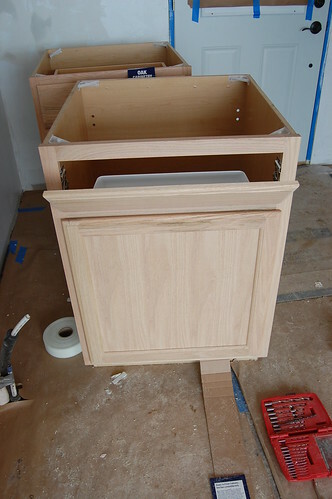 I was wondering about doing the same thing you did that is converting base cabinet to sink base cabinet. I hope structurally it can handle the weight, but either way if you did it I’ll have to give it a a shot. Thanks again for the empowerment! Thanks for posting! 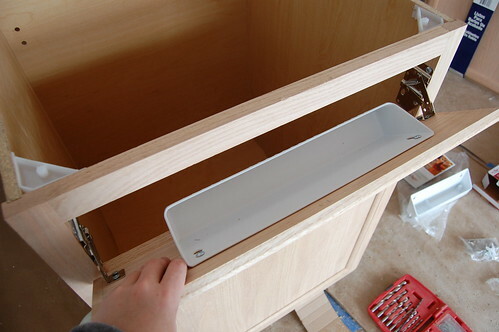 This is just what I want to do… use a drawer base cabinet for a sink base. 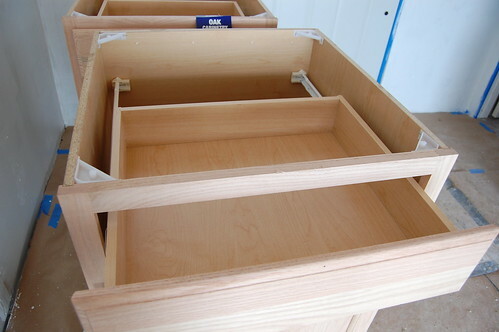 Now, I just have to figure out how to shorten the bottom 2 drawers so the plumbing will fit “behind” the drawers. 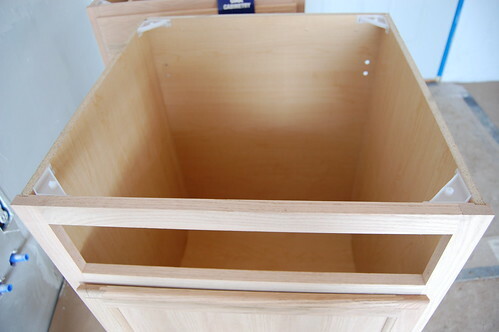 How do I add support to use a base cabinet and turn it into a sink cabinet?